From an early age, Carol Walker Bryant knew art was a part of her soul. Winning her first art contest at the age of six, Bryant followed her dream and has continued to fan the flames for her passion and pursuit of art! Receiving her degree in commercial art in 1991, and minoring in Fine Art, Carol has since been painting, sculpting and creating unique and diverse styles of art. From oils, pastels, watercolor, acrylic, collage, encaustic, Ink & Gouache, Clay in addition to photography, Bryant has successfully triumphed over each medium wining critical acclaim and awards locally as well as in regional competitions. Grateful for all the joy and acclaim she has received through her God-given talents and opportunities, she shares those talents by teaching. Carol delights in seeing her students earn honors, awards and recognition and celebrates the joy of art with each of them! Bryant is past president of the Austin Palette Club and Canyon Lake Art Guild and has coordinated various art shows. Herb Booth is one of the best known and most sought out after painters of sporting and wildlife scenes in Texas. Influenced by the Sporting Art Tradition and artists like John P. Cowan, Booth's work has appeared in many national sporting magazines and he has designed 11 national conservation stamp prints. He work is recognized for his sense of authenticity and depth of personal experience. In 1993, In the Sporting Tradition: the Art of Herb Booth was published by Texas A&M University Press. For the past 20 years, he has specialized in personalized sporting scenes, capturing families hunting or fishing. They have become valued heirlooms to many families. Booth was selected as the Rockport Art Festival Poster Artist in 1996. My medium of choice is rather unconventional, watercolor pencil with ink, and animals are my primary subjects. I have been drawing since I was old enough to hold a pencil and studied Studio Art at the University of California Riverside. I hold a degree in Commercial Art and have worked for magazines, print shops and newspapers. I worked in the commercial art business for years, but fine art has always been my "therapy". I especially enjoy painting and drawing birds and local Texas wildlife. We relocated to Rockport in 1998 due to it's beautiful location, excellent fishing and wonderful artist's community. My style of art lends itself to depicting wildlife and the abundance of unique plants and animals in the region provide a multitude of subjects. I enjoy studying my subjects in depth before I pick up my pencil. My work as been featured on the 2014 and 2015 Rockport-Fulton Hummerbird Festivals, the 2016 Port Aransas Whooping Crane Festival and the 2016 Rockport Fulton Seafair t-shirts. Winning these contests has enabled me to meet hundreds of people. They've truly been some exciting experiences. Shirley Hughes Blackman is a lifetime artist. She won her first art award for drawing at just six years of age and, as Miss New Mexico, was the first contestant to name art as her talent in the Miss America Pageant. She graduated from Baylor University, going on to do advanced studio work in Paris with Reynold and Marthe Arnould. Shirley has been a full time artist since 1970, exhibiting in numerous solo shows and being recognized in both national and international exhibitions. Her work is in many private and public collections in the United States, Central America and France. At home in Rockport, Texas, her studio is in the Austin Street Gallery where her work is exhibited. Shirley was recently named the 2010 Rockport Art Festival Poster Artist. Chances are you've seen the work of Bruce Bitter, either at any one of the last 12 Rockport Art Festivals, on the Art Auction Invitation, or in several Rockport area homes. If not, Bruce's work comes to the spotlight as the 20th Rockport Art Festival Poster Artist. Based in Austin, Bitter's pastels evoke the joy of living on the coast. "As a Texas resident for over 12 years, my work has evolved to encompass a variety of techniques and styles. Originally from the Jersey shore, I was an avid surfer and beach junkie. 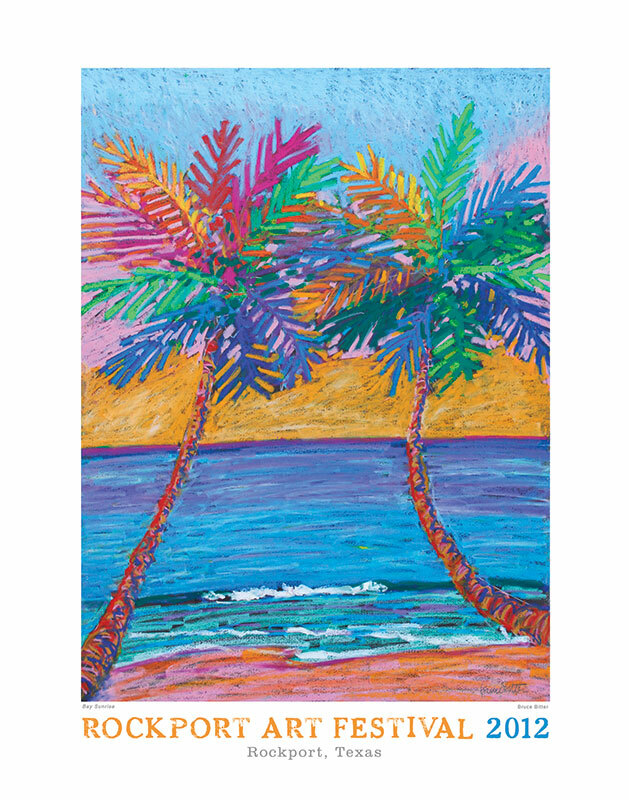 Encouraged by numerous trips to the tropics, I created a genre of beach images, first as Serigraphs and Monoprints, now as Pastels and Mixed Media. The motivation to employ other subject matter and techniques comes with more time to do so and the ongoing summons to constantly challenge myself as an artist. My continuous goal is to engage the viewer to identify with my art, whether it be a form of decoration, a destination or an aesthetic attraction. I try to create a process into everyday life by connecting to popular culture and current trends. I strive to be creative and always pushing the envelope while producing the best work possible." A 30 year resident of Rockport, Nanci Barnes's work has appeared at the Dallas Museum of Art, the Gallery of Rockport, and the Houston Center for Contemporary Craft. In 1999 she was featured in Architectural Ceramics for the Studio Potter. Her recent work includes major commissions for private installations, as well as public commissions for the Corpus Christi Public Art Program, Hoopes House, and Al Johnson Construction. Barnes was selected as the Rockport Art Festival Poster Artist in 2007. Martha Berkebile has been drawing and painting since she was a child. The beauty of people and the earth are strong influences in her art and jewelry. She lived and painted portraits in Goodrich, Michigan prior to moving to Chicago in 1992. In Chicago she had the opportunity to paint a reproduction of Rembrandt’s ‘Old Man with the Gold Chain’ at the Chicago Institute of Arts. She moved to Rockport in 1994 where she began teaching drawing and painting classes (as Martha Williams). Since then, she has added mixed media sculpture and jewelry making to her repertoire. In 2003 she married her husband Alan Berkebile. She also completed a MS in Geology to better understand the earth. In early 2010, Martha began Two Hearts Studio and sells her work on line at her etsy shop http://TwoHeartsStudio.etsy.com. She enjoys working with people to create unique treasures of portraits, jewelry and sculpture. The main source for inspiration may be the Caribbean for the majority of Al Barnes' paintings, but he is equally at home in the coastal marshes of South Texas. Water is the binding factor in all of his paintings, whether it's Bonefish tailing on the flats or Pintails lifting off a tidal marsh. Al Barnes has had numerous one man and group exhibitions to his credit and is hung extensively in private and corporate collections around the world, including the National Wildlife Museum in Jackson Hole and The American Museum of Fly Fishing, the Meredith Long and Co., and the Art Museum of South Texas. He has been National Ducks Unlimited Waterfowl Artist of the Year, two times Texas State Ducks Unlimited Artist of the year and Coastal Conservation Association Stamp Artist, three times Texas Saltwater Stamp Artist, National Ducks Unlimited Stamp Artist and two times International Game Fish Association Featured Banquet Artist. His work has been accepted in a number of shows, including the Birds in Art show in Wausau, Wisconsin, The Mystic Maritime International in Mystic, Connecticut, the SW Pastel Society and the SW Watercolor Society shows to name a few. His work has also been featured in magazines such as Sporting Classics, Gray's Sporting Journal, Southwest Artist, Florida Sportsman, Marlin Magazine and Artist Magazine. He was selected as the Rockport Art Festival Poster Artist in 1995. Kay Barnebey formerly taught math & science in the Rockport-Fulton SchoolDistrict. She holds a Masters in Math & Science from Texas A&M Corpus Christi. Barnebey is known for her acutely painted transparent watercolors. She was a two-time Poster Artist for Aransas Pass Shrimporee, and in 2000, was selected as the Rockport Art Festival Poster Artist. In 2007, she was invited to design an ornament for the White House Christmas Tree. Her love of the Ridley Sea Turtle and many other endangered and common species of the Texas Coast is evident in her work. Kay continues to teach watercolor classes at the Rockport Center for the Arts and at the Art Center for the Island. At 10 years old Lisa Baer was taking painting classes with Simon Michael, a founding father of the Art Colony in Rockport. Lisa continued to come to Rockport every summer, taking classes, working in her aunt's gallery (the gallery of Estelle Stair, a founding member of the Rockport Art Association) and soaking up the Rockport sun. Years later she continues to make work reflective of her Texas coastal experience, and does so in an original, contemporary style. Baer has quickly established a unique identity and a personal approach to art, whether capturing scenes of the Texas Coast or wildly colorful abstractions and collages. Baer was selected as the Rockport Art Festival Poster Artist in 2009, during the Art Center's 40th Anniversary Year.